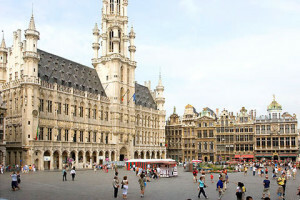 Brussels is the capital of Belgium and the headquarters of both the European Union and the North Atlantic Treaty Organization (NATO). What began as a mere fortress outpost in the 900′s has grown into a sophisticated metropolis, admired the world over for its architecture and its food. 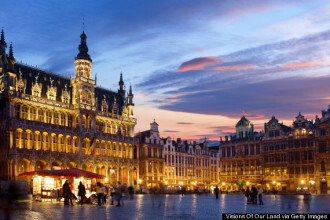 Brussels is a bilingual town, where residents speak, and street signs are printed in, Dutch and French. The people of Brussels are known for a sharp sense of humour, as evidenced by the Manneken Pis, the city’s most famous statue, which depicts a urinating boy. 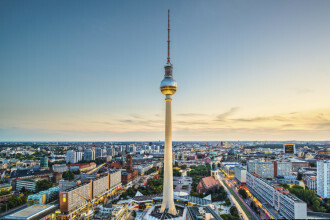 Below are descriptions of five can’t-miss attractions if you’ll soon travel to this lovely city. 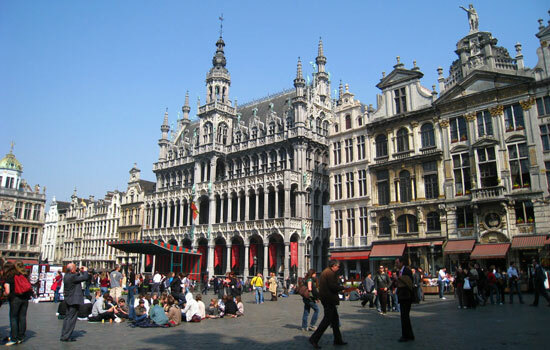 The grandest place in Brussels is the Grand Place. Originally a market in the 1200′s, this palatial landmark is today a centre for the city’s residents and tourists. It’s a gilded architectural masterwork, where you can take in concerts, admire quaint churches, enjoy charming cafes, and people-watch to your heart’s content. Come in the spring and the summer, and you’ll see the Grand Place’s flower market in full bloom. Or come at Christmastime for the giant Christmas tree, elaborate lighting, and the Christmas Village, a market selling all kinds of Christmas decorations and edible treats. 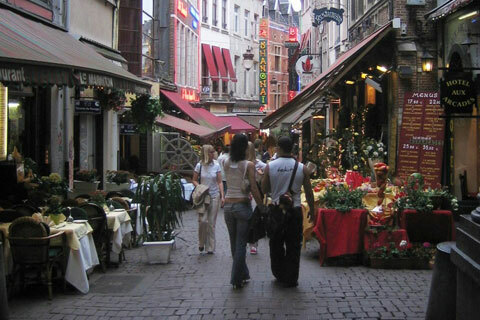 Stroll the Rue de Boucher and you might momentarily think you’ve stepped back in time to the 1600′s. This avenue is lined with restaurants and cafes, many boasting ornate doors and large fish hanging in the windows. Many different kinds of cuisines are available on this street, including Indian and Chinese. For families, the restaurant Aux Armes de Bruxelles is a reliable choice. It offers tasty steaks, a traditional Belgian stew called waterzooi, and some of the best mussels in Brussels. The 1958 World’s Fair was held in Brussels, and for this fair the city constructed the stainless-steel Atomium Building, which resembles a giant, round molecule. 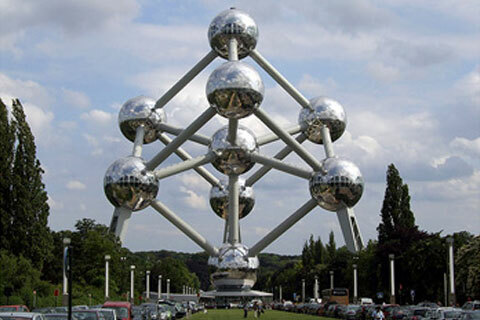 This monument includes nine connected spheres, and you can reach five of these spheres via elevators. The view from the top sphere, 335 feet high, is spectacular. At night, the Atomium dazzles, decked out as it is in brilliant blue lights. The building is also home to an outdoor bar, an indoor panoramic restaurant, and a mini-museum dedicated to the 1950′s, including gigantic wall photographs of fifties movie stars. 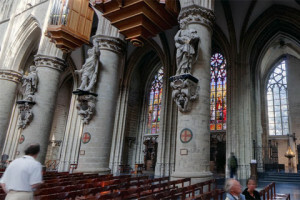 The Cathedral of Saints Michel and Gudule, the seat of the Malines-Brussels Catholic archdiocese, began as a crypt in the 900′s and was finished in the late 1400′s. 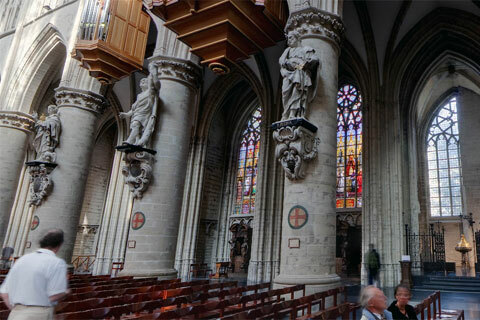 Predominately built in a style of architecture known as Brabant Gothic, the cathedral sustained heavy damage in 1695, when French forces bombarded Brussels. State funerals are often held here, and the cathedral houses a collection of priceless medieval religious relics. 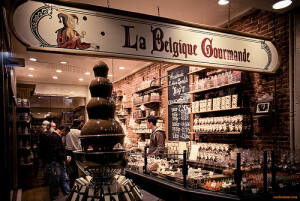 Brussels is the world’s choco-champ. The chocolate companies Leonidas and Godiva make their homes here, and a Brussels chocolatier named Jean Neuhaus first came up with the praline in the early years of the twentieth century. The city’s teeming with excellent places to buy the stuff. There’s Mary on Rue Royale, which since 1919 has offered all-natural gourmet chocolate made from beans from all over the world. There’s Laurent Gerbaud on Rue Revenstein, which sells delectable concoctions mixing chocolate with spices and fruit. And there are many, many more. Come to Brussels in late November for a brand-new tradition: Chocolate Week. This is a week when the city sells visitors “chocolate passes,” tickets admitting them to tastings and workshops throughout Brussels. Be forewarned: if your friends and family know you’re going to Brussels, they’ll probably expect you to bring home some chocolate for them.